2solve is an advanced and innovative OSS solution designed to support the entire troubleshooting process: From a fault is detected until a resolution has been validated. With 2solve, you do not need any other tool. Watch our online video demonstration. 2solve facilitates your entire troubleshooting process: From a fault is detected until a resolution has been validated. A user-friendly interface and advanced visualization makes data available to more staff members. This enables effective communication about the state of the network from Front Line Support to Back Office: It is easy for Front Line Support to check whether the complaint is due to a network incident and provide the customer with initial feedback. 2solve provides detailed network data and a list of probable faults. 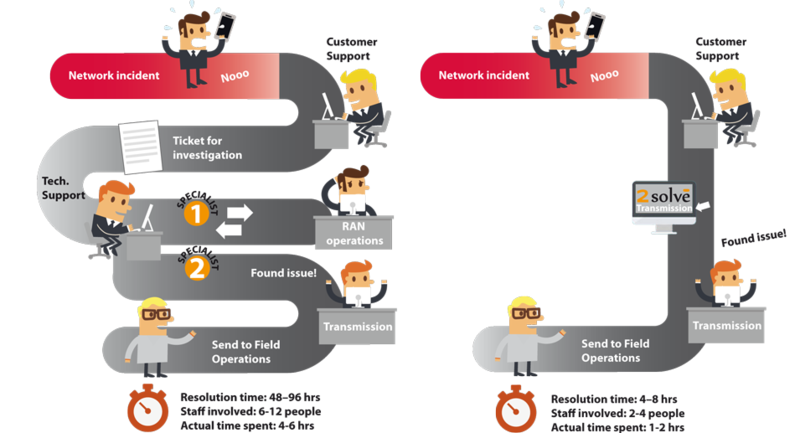 It is thus easy to assess a network incident and send the relevant information to the right Back Office expert. Proactive troubleshooting that makes a difference for the end customer! With 2solve you will be able to detect and resolve network incidents before end customers are affected. 2solve can be set up to send alarms of cells showing abnormal performance and reports of worst performance cells in the network according to any KPI configured in the system. This means, that you can continuously monitor and verify the quality of the network. You can also use 2solve to analyze the network for cells with a specific fault. You can thus proactively improve network quality by detecting and solving network incidents before end customers are affected. Can respond fast and accurately to customer complaints about network quality issues. Can send trouble tickets directly to the right expert or specialist unit. Can set up reports to proactively detect service degradations before customers are impacted. Can quickly assess the impact of network incidents and thus make the right decisions on when and how to act. Our OSS solutions are ready-made for Huawei, NSN and Ericsson, and can be adapted to any other vendor within a few months. From the day you place your order, our 2solve team will implement your new 2solve OSS solution within only two weeks. From the day you place your order, our 2solve team will implement your new OSS solution 2solve Troubleshooting Suite within only two weeks. The 2solve Troubleshooting Suite is very easy to access and you will very quickly be able to use all the features in your new OSS tool. Our 2solve team will make sure, that all staff member groups get the training required to use the tools. Technical support via email is open all year 24 hours a day, 7 days a week, and phone support is available all working days from 9-16. We always strive to deliver high quality to our customers regarding both product and experience. Therefore, please let us know, if you request a feature, which has not already been implemented in our product. 2operate is Europe’s Most Innovative Provider of Operations Support Systems.